Highlights of the Christmas holiday season in Humboldt County are three famous Christmas lighted trucker and tractor parades, plus spectacular lighted tree displays. You may come for a parade, but don’t miss all the other great musical and theatrical holiday performances, plus unique shopping, great eats, and Christmas cheer. The Redwood Riverwalk Hotel in Fortuna makes a great home base for your holiday season getaway – close to events in our community, Eureka’s Old Town, and Ferndale’s Victorian Village, surrounded by the natural splendor of the redwood forests, and not far from Arcata’s Season of Wonder and Light. The Al & Edie Gray Electric Lighted Truck Parade in Fortuna isn’t just for the big rigs! In this parade, the community decorates all kinds and sizes of wheeled vehicles with brightly colored lights – from trucks and tractors to floats, ATVs, bikes, scooters, and even people are decked out in lights! Downtown Fortuna businesses host their Annual Holiday Open House to coincide with the Parade –visitors can enjoy the parade, refreshments, and do some holiday shopping. Location: The parade begins at the Redwood Village Shopping Center, 735 S. Fortuna Boulevard, and travels up the street to Downtown Fortuna. The parade ends at Main Street, where the vehicles park so that visitors can view their decorations and enjoy refreshments. Date and Time: Friday, December 7, 2018, at 6:30 pm. 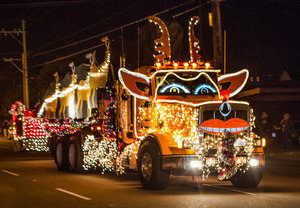 The Truckers Christmas Parade is a 25 year old tradition on the Redwood Coast. A convoy of 50 to 100 18-wheelers winds through the streets of Eureka to celebrate the holiday season. Imagine the melody of Jingle Bells tooted by the horns of these huge rigs decked out in thousands and thousands of colorful Christmas lights – some are covered in more than 40,000 of them. Be sure to watch out for dancing reindeer, flying fish, or other unexpected passengers! Date and Time: Saturday, December 8, 2018 from 6:00 – 8:30 pm. Visitors to the Avenue of the Giants and Humboldt Redwoods State Park can enjoy the Humboldt Redwoods Interpretive Association’s 30th Annual Christmas Tree Lighting and Open House. Celebrate with homemade treats, hot drinks, Christmas carols, and do some last minute shopping at the gift shop, too. Location: Visitor Center at Humboldt Redwoods State Park, located south of Weott, CA, on the Avenue of the Giants. Date and Time: Wednesday, December 12, 2018, at 6:00 pm. Ferndale’s Christmas Lighted Tractor Parade features tractors and tractor-drawn wagons decorated with holiday scenes. To add more holiday cheer, the Ferndale Community Church will serve free cookies with cocoa and cider during the Parade. 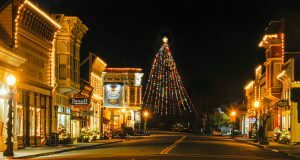 The festive Parade down the Victorian Village’s historic Main Street complements the sparkling lights on Ferndale’s the towering Christmas tree at the end of the street. It’s America’s Tallest Living Christmas Tree, a holiday beacon visible from miles away. (The Tree Lighting is Sunday, December 2, 2018). Date and Time: Sunday, December 16, 2018, from 5:00 – 7:00 pm. Location: Main Street, Ferndale, CA; refreshments at 712 Main Street. Visitors to the Redwood Coast can enjoy Christmas musical and theatrical productions as well. The Ferndale Repertory Theatre, in collaboration with Humboldt Light Opera Company, will present A Christmas Story from November 23 – December 16, 2018. It’s great holiday entertainment for one and all. Tickets: $18.00 adults, $16.00 students (15-college) and seniors (60+), $10.00 youth (ages 3-14). A $2 Historical Building Preservation Fee is added to each ticket. The Fortuna Christmas Music Festival will celebrate music of the season at a free concert featuring a variety of musical groups including an orchestra, bands and choirs. Date and Time: Sunday, December 9, 2018 from 1:00 -7:00 pm. To take in another holiday classic, The Nutcracker Ballet, plan your weekend getaway for December 14 – 16, and enjoy North Coast Dance’s production in Eureka. Dates: December 14, 15, 16, and 18, 2018. It’s going to be a merry and bright holiday season in Fortuna, Ferndale, and Eureka this year, so come and join the celebrations. 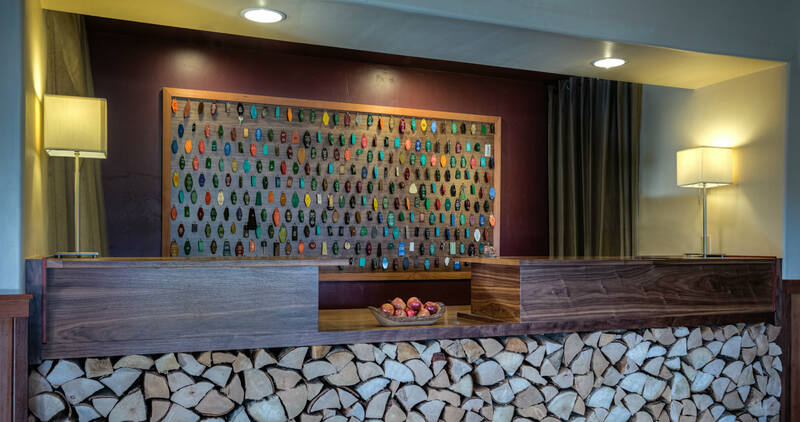 We look forward to welcoming you for a stay at our conveniently located hotel in the heart of the Redwood Coast – near to all these Christmas events. Just give us a call at (707) 725-5500, or go online to book your December getaway with us – it’s going to be a festive month in Fortuna! This entry was posted in Area Activities, Concerts, Festivals, Holidays, Theater, Things to do, Uncategorized and tagged CA redwoods hotel, Christmas lighted tractor parade, electric lighted truck parade, Entertainment, Eureka, Ferndale victorian holidays, Fortuna, Music, truckers Christmas parade by admin. Bookmark the permalink.